SIX is an architecturally inspired side chair manufactured from specially produced honeycomb composite and 4mm steel wire. The design pays homage to the striking aesthetic born from the functional design of industrial structures (think Eiffel tower) and light and space. Shown here in chrome with clear panels, a wide variety of color options for the frame and a selection of standard and metallic tints for the panels. 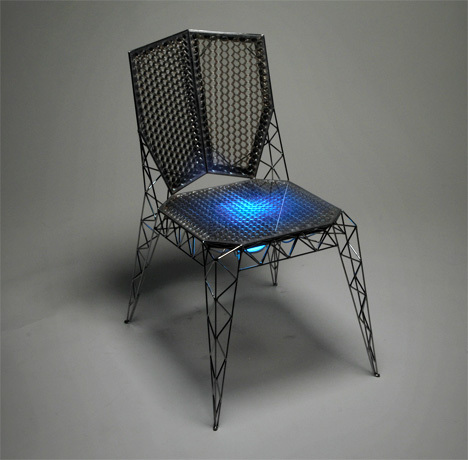 The chair also features a detachable light that illuminates the honeycomb seat (Cylons! ), creating a funky and unique lighting effect. The wedding chapel isn’t a building type with a great architectural pedigree; it’s usually a cue for syrupy swags and allusions aplenty to classical temples and Rococo palaces, all crammed into a structure that wouldn’t look out of place in a trailer park. 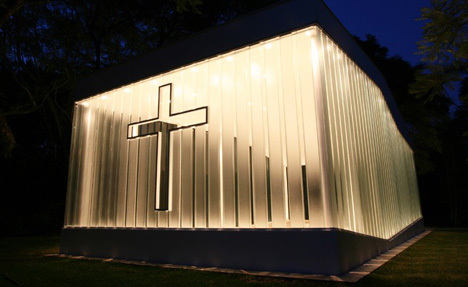 But given the right brief, the genre offers plenty of scope for small scale innovation, as in the small Chapel of La Estancia by Bunker Arquitectura. The owners of the colonial-era gardens in Cuernavaca, just south of Mexico City, had built up a business offering wedding packages to young couples, and originally wanted an ersatz colonial-style chapel structure in which to host the ceremonies. Happily, Bunker persuaded them otherwise, and set to work devising a modern, functional yet undeniably romantic setting for the events. Initial plans for a glass-walled building were opposed by the client, who claimed - quite reasonably - that it would heat up throughout the day and make ceremonies sweaty and unbearable. 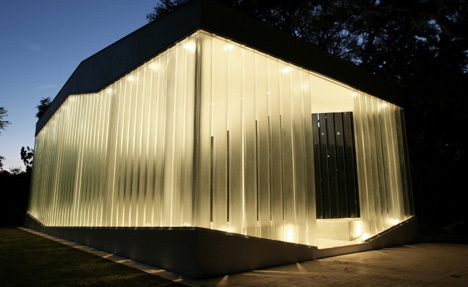 But Bunker stuck to their guns, explaining that their solution involved a latticework of opaque glass beams, arranged vertically and set apart from one another to create a ‘veil’ running around the entire structure that allows air to move freely. Above this sits a solid roof, its shape devised by the shearing, pinching and shifting of the original box-shaped volume, forming a simple yet elegant shallow pitch. A la Carte means a free choice from a varied offering. 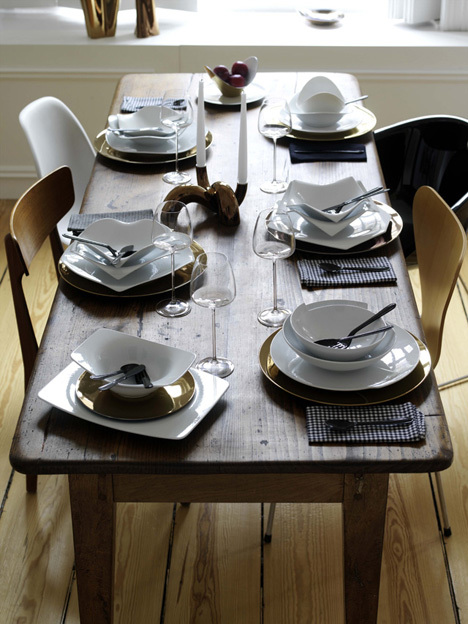 An innovative concept that corresponds to modern tabletop culture is hidden behind this expression for the Rosenthal studio-line: Namely, the ability to combine different set elements for an attractive tabletop setting. Six new organically formed porcelain services each comprise three sculpture-like sets that assume the functions of bowls and plates. The design of the Origami set is influenced by the Japanese art of folding paper; Nimbus, Poncho, Scoop, Tatami and Papyrus are both expressive and soft in form and enable users to celebrate new styles over and over again. Is it a bottle in front of me, or a frontal lobotomy? Anyway you look at this mind blowing wonder of math and the space-time continuum, the Klein Bottle House by architects McBride Charles Ryan, is stunning. For us right-brain thinkers; in Mathematics, the “Klein Bottle” is a non-orientable surface, i.e., a surface (a two-dimensionaltopological space) with no distinction between the “inside” and “outside” surfaces. 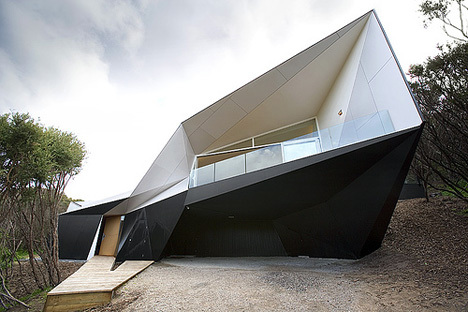 That being said and hopefully understood, this vacation home located just a few clicks outside Melbourne, Australia beautifully reflects a deep desire to mess with both sides of our brains. By constantly challenging our sense of perception, depth, linear orientation, interior/exterior space and pretty much any notion of what a dwelling should look like, the architects have successfully created a space that is surprisingly inviting and warm. Now can someone please show me to the door?